"If we don't hit Brady, we don't win the game"
O.K., let me add my two cents. First, this was arguably the worst football game the Patriots had played all season, with a score lower than Bush's approval rating. The Patriots had a season record low of a mere 14 points, saw Tom Brady sacked a record five times, and Brady was pressured nine times. This game also saw a Patriots season record of one touchdown - that's right, Brady only got the football in the end zone once! Second, the football Giants' defense played like they were on fire. It was painful to watch the Patriots try to move the football. The Patriots achieved an unbelievably low 45 rushing yards, possibly the lowest rushing yards for any game this season. The Giants held the Patriots to a scant 266 passing yards, making this Superbowl a game that Tom Brady hopes to someday forget. Third, just how did the Giants pull off the biggest upset in football history since the Jets beat the Colts in 1969? Crippling Overconfidence. Just before the game got started, several Patriots invited the Giants to their victory celebration. According to a post-game interview, this stupid smugness on the part of the Patriots fired up the Giants linebackers. Words like "arrogant" and "overconfident" were thrown around, and rightfully so. In football, like in any competition, you want your opponent afraid of you - you don't want to make him angry because a skilled and seasoned competitor will take that anger and motivate it against you (read "Harnessing Anger - The Inner Discipline of Athletic Excellence" by fencer Peter Westbrook). As the Boston Herald's Gerry Callahan put it, Patriot's fans viewed this football game as a coronation rather than a competition. The team's front office even tried to trademark "19-0". it appears that the Patriots themselves were victims of their own hype. Bullied Brady. Tom Brady was the Patriots entire team and Belichick played as if there was no backup quarterback. Even during the regular season when the Patriots were piling it on the overmatched Redskins, Tom Brady handled the football the entire game. So what did the Giants #1 sack defense do? The Giants admit that their strategy was to prevent Brady from finding a rhythm by hitting him right from the game's first whistle. They gleefully shut Tom Brady down to an embarrassing completion record of only 29 out of 48 passes. Brady was blitzed like he never had been blitzed before, and during TV close-ups it showed on his worried face. 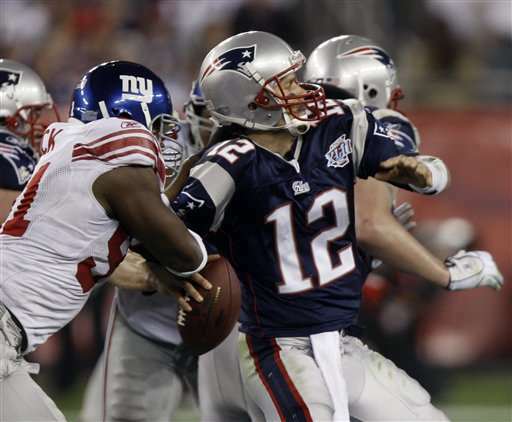 Even when the play wasn't a blitz, Giants linemen often tricked their way into get to Brady. 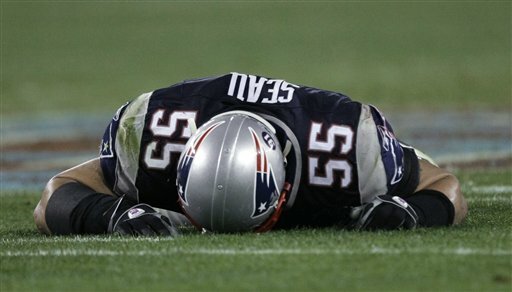 Five sacks cost the Patriots 37 yards and even forced Brady to fumble the football. Brady hasn't been sacked that many times in five years (Jets sacked Brady five times 92 Patriots games ago on Sept. 21, 2003). Brady's confidence was so eroded he threw some of his worst passes of the season, with the football easily missing his receivers. According to Giants' defensive end and NFL 2007 season sack leader Michael Strahan, "We were making [the Patriots] look mediocre"
And, you know what? Sorry, Patriots fans, but any quarterback that can't handle the pressure when his line is challenged can't be called a "great" quarterback. What would Vince Lombardi say? No Running Game. The Patriots achieved a humiliating 45 running yards, and only passed the football for 266 yards. Randy Moss was double and triple teamed most of the game and only caught the football once during the first half. Sack Success. The Giants led the league in sacks this year. Peyton Manning. gave Eli Manning the confidence and the insight to take a young new quarterback and get his brother to outplay Tom Brady. Dumbest play of the game: In the third quarter, with the Patriots in a 4th and 13 situation on the Giant's 38, Belichick opted to go for the first down instead of kicking the football for a 49-yard field goal attempt. While desperately evading the Giant's blitz, Brady threw what was arguably his worst pass of the game as the football sailed right out of the end zone. Biggest Disappointment: Starting at the Patriots' 26 yard line with 29 seconds left in the game and all three timeouts, all the Patriots needed was a field goal to tie the game and send it into overtime. Bill "Dr. Frankenstein" Belichick had created Tom Brady for just this purpose. Instead, to everyone's amazement, Belichick's creation went haywire and four downs later, the Patriots surrendered the football - and the game - with one second left ten yards back from where they started. Sudden Death. Why does it seem that almost every time a Boston team wins a championship, somebody on the streets of Boston is killed during the celebration? During the Patriots' Superbowl victory of 2004, that night on the streets of Boston one person was killed as celebrators set fires, overturned cars, looted stores, and assaulted bystanders. Bonfires were set. One local television station van that took video of one riot was placed under siege by frenzied fans. While Boston's local news media can of course choose to take video and photos of these interesting riots without being noticed, for some curious reason they choose not to - possibly because the truth would hurt the manufactured sports image of Boston? James Grabowski, only 21 years old and a student at St. John's Prepatory Seminary, was killed during the Patriot's Superbowl victory celebration on Feb 1, 2004 when a 1991 Toyota Land Cruiser driven by a man with a staggering 0.09 blood alcohol level, plowed into a crowd of revelers near Boston's Northeastern University. The 4,000-pound SUV killed Grabowski, injured three other students, and crippled another. During the Feb 2002 Red Sox World Series victory, a celebration near Kenmore Square turned horribly violent. Rioters trashed a MacDonalds, set fire to a trash bin, and assaulted residents. According to eyewitnesses, when Police showed up on horseback the rioters turned on the Police and threw bottles, trash, and anything else they could find at them. Several policemen were injured by broken glass. According to the Boston Herald, 30 to 40 seconds after the crowd began throwing bottles at the police, police finally responded to the danger and fired two pepper balls up over the crowd. Victoria Snelgrove died after a pepper ball came down and hit her in the eye. As Victoria's friends knelt over her desperately screaming for help, rioters continued to smash windows of storefronts and attacked police. An ambulance had trouble getting to Victoria because of the violence surrounding the area. Boston boasts the highest sports victory death rate. This year, Boston had a massive police presence of close to 500 officers that deterred street riots. The Boston Globe reports that this year, the sight of policemen standing shoulder to shoulder in riot gear caused Bostonians to be "too scared" to celebrate outdoors. 7-Jul-08 Update: On June 18, 22-year old former Boston student David Woodman died in police custody during a street celebration of the Boston Celtics championship celebration. According to reports Woodman, who had a heart condition, was celebrating on the streets of Boston when he walked by a group of police officers with an (illegal) beer in hand (dumb mistake #1). He then insulted the officers (dumb mistake #2). Woodman ignored the officer's shouted orders to stop (dumb mistake #3). He was handcuffed, and some time after that suffered some sort of seizure. Tragically, he died a few days later. Destruction. Of course, this year's 2008 Patriots Superbowl loss didn't stop 300 Massachusetts University of Amherst students from rioting, causing police to be called in wearing riot gear and arresting many of the students (Boston local news frowns on broadcasting these disturbances). In the past four years, more than 145 Boston area students have either been arrested or faced sanctions as a result of violence, disturbance, or destruction of property during a Boston sports "celebration". Low Class Belichick slunk off the field and scurried down the tunnel before he could witness his defense's last, if not ceremonial, stand on the field as the Giants took a knee with one second left. While it appears that referee Mike Carey asked Belichick to stay on the sideline, TV viewers watched a scowling Belichick brush Mike aside as he tucked tail and ran from the field. This set another record, with the Patriots running the only play of the season with their head coach abandoning them on the field. Character is not something you see when someone wins - it's what they show you when faced with inevitable defeat. Belichick's bankrupt character was there for all to see. On the other hand, Belichick did set a new record - the only time in Superbowl history that a football team ran a play without their head coach being on the field. Low Class Tom Brady chickened out of playing at the low aggression Pro Bowl, citing an allegedly injured ankle as an excuse. O.K., sure. Patriots' receiver Randy Moss also has said he will not attend, claiming an ankle injury. Huh. Must be something going around. Piling it on the beleaguered Redskins in a 52-7 pummeling was an unsportsmanlike and disgusting football game, as well as his bullying of Buffalo (56-10). Belichick should be ashamed of himself for disgracing the game of football that way. History, however, is not without a sense of irony and the Giants taught the Patriots that very lesson. Spygate (thought I'd forget that, did ya?). Enough has been written about the Patriots and cheating, but for the people making excuses of "everyone in football does it", let me add this - if everyone does it, why is the only the Patriots get caught?